Every year you read of nativity displays being banned from public areas, crosses taken down as Christmas tree decorations, and even the greeting of Merry Christmas forbidden in government work places. Why? Because of real or threatened lawsuits from atheists. Why do atheists hate the symbols of Christmas and Christianity? It isn't because they don't believe in a god. I don't believe in Buddha but I don't get angry every time I see one. There is a reason atheists hate Christmas displays and Christian symbols . . .
Because they hate the light! This is not a minor point, it is the point! Jesus Christ is the Light of the world. Our faith is a light to a lost and dying world. Jesus says: "Let your light shine before men that they may see your good works and glorify your Father in heaven." This year the Survivors are going to be that light! The Survivors are going to lead a Festival of Lights! We are going to bring to the city streets and government buildings -Light! Using large format mapping projectors we are going to project nativity scenes on the buildings from which they are banned. We are going to project the Christmas message on skyscrapers, government buildings, city halls, court houses, and public places. We will sing Christmas carols beneath the glow of projected nativity scenes. We will gather and pray as we project reminders of the massacre of innocents both in Jesus' time and the massacre of innocents going on in our country today. We will project famous works of art celebrating the birth of Christ. This has already been done in Europe on famous buildings and it is beautiful. We will sing and we will shine our light for all the city to see! These large-scale projections are set to be the signature trademark of the Survivors. As we travel from city nightscape to city nightscape with a message so large it will be like a Bat-sign over Gotham. I know Survivors will get invitations from people in cities all across America to shine the light of love, life, and Jesus Christ in their city and towns and schools and government buildings!!! Imagine a display that can be seen for miles and the ACLU can't shut it down! During the winter we can project images from 5pm until midnight and beyond for cities that never sleep. We can gather, shine the light of Christ, we can sing and share the joy of the Christmas season with our neighbors. Written in the midst of our Civil War when Americans were fighting Americans, by Henry Longfellow as his son lay severely wounded. One could imagine the despair he felt for his nation. Of peace on earth good-will to men. Today many in our nation speak of a civil war once again. And I believe we are indeed in a Civil War. Abortion, the killing of over a million Americans per year, is legal in all 50 states, prayer is not allowed in schools, nativity scenes are banned and crosses are being removed! Our nation is divided and I think it is accurate to echo his words that hate is strong and mocks the song of peace on earth good-will to men. Our 21st Century Civil War is not a war of bombs and bullets but a war of light versus darkness. Our job is to let our light shine and this Christmas season the Survivors intend to do just that. Not just to "stick it to the haters" but to really shine the love of Christ, the glory of the good news and the value of all human life because that little unplanned pregnancy changed the world forever! We are in a Civil War and so what better time than Christmas to let our light shine before men? What better time to shine the good news and a warning of the tragedy of abortion in and on our cities? And who better than the Survivors of America's Abortion Holocaust, Survivors of the modern massacre of the innocents in the middle of their nation's second civil war to take that light to the skyscrapers and city buildings? This project is bigger than anything we have attempted before. We believe the impact will be greater than anything we have done before because of the sheer size of the projection! We know it will be a newsworthy and impactful story as the Survivors light up the night with forbidden phrases, scenes and symbols. Will you help Survivors shine the light of Christ, the nativity scene, and great works of Christian art in the public square from which they have been banned? Please, help us shine the light this Christmas season by giving a generous Christmas gift today. Your gift of $35, $50, $75, or $100 will light of the world this Christmas. If you can give a special end of the year gift of $1000, $5000, $10,000 or more, it will mean the Survivors have the resources and powerful projectors we need to put the Christmas message and the message of life on full public display where even the ACLU can't stop us!!! Time is short, Christmas is upon us. Please send the best gift you can today! Let us be thankful for the country we have and not despair. And please give today and let's really light up our cities with the Christmas message of life! P.S. God say to not hide our light under a bushel but to let it shine before all men. And that is exactly what the Survivors intend to do this Christmas Season. We are going to light it up and light it up big! Please give the best gift you can so we can really shine the light in our cities, public places, and on our government buildings. Help make this possible with a donation today. She is liberal beyond words! Have you seen her shows? She is going do a hit piece! These were the warnings from many of my friends about sitting down for Sarah Silverman's “I Love You America” TV series. But I did it anyway. Why, why, why!?!?! Well, this isn't my first encounter with the liberal media. My experience has been that, as often as not, I get a good if not fantastic result. For example, Al Jazeera News stayed with our Survivors for nearly 5 days. What resulted was an five-minute piece Survivors could use as a promo piece. Then the BBC embedded a reporter in our Summer Training camp as a camper. The name of the piece -- and we knew this before she came -- was "Brainwashing Stacey Dooley!!!" The 45-minute documentary was a great piece and the young people won Stacey over. My core belief is that even though the liberal media may hate us, and in this case, she would probably mock us, The core of what we believe rings true to the listener and for that matter the person doing the interview. Often, we get our message out in spite of the best efforts of the host. In the case of the Sarah Silverman show, I found it fair enough. It is comedy on an explosive topic and generally not funny. But I found Sarah very nice in person. When I sat down with her I said -- "Sarah, not a lot of conservatives are willing to sit with you but I do so willingly. I have just one request: Be funny without being cheap." I think she did that. I think Cheryl Conrad and the Survivors did a great job too. The Survivors on the street showed engaging activism on Pier 39, Even Sarah's description of Survivors was good enough for me. There are a couple of crude parts and I think the Survivors handled it well. We are going to be getting more and more requests to do shows as word of Survivors and the Fetal Uprising spreads. Would you consider giving a donation right now so the work of Survivors and the revolution that is Fetal Uprising can continue? Your giving makes our work possible. Now back to the show, Let me know your thoughts! And so I live to be mocked another day! Here are links to some of our outstanding media coverage! After a fatal mishap with a cryogenic freezer at a fertility center in Cleveland, OH, women are mourning the loss 4,000 frozen eggs and embryos. This immensely tragic event sparks the discussion over what exactly was lost. The women who lost embryos and eggs have taken to the courts to get help, and they seek personhood for the lives lost in the freezer malfunction, which would charge the center with wrongful death. IVF not only freezes eggs, but it freezes embryos, the first stage of a person’s life. At this stage, even with only 8 cells present, scientists are able to decipher if the embryo will be a baby boy or baby girl. 8 cells is so minuscule and yet they are markers of new life. “Thanks for disrespecting those bereaved parents” who “birthed, held, nurtured, raised and cared for and buried” their children, from a woman who had lost her son to cancer. We need to support these women and families who lost not just an embryo, but their children. It is more than appropriate for them to mourn as such, and seek justice for the lives lost. This debate will be instrumental in the debate on how we define personhood. Our law should treat life in all stages the same. A person is a person, whether they have 8 cells or 37.2 trillion. The Survivors ProLife Boot Camp Returns! The Survivors are returning to San Francisco for our 21st annual Survivors ProLife Boot Camp. Last year I asked humorously, "San Francisco? Are you crazy?" I didn't know what to expect. After all, San Francisco is a liberal, pro-choice, immorality hotbed and what would be the reaction to the anti-abortion message of our young Survivors? I feared violent reactions, police harassment, aggressive counter protesters and angry passersby. For the most part it didn't materialize. What common incredulous response did we get? "What are you doing in OUR city?!?!?!?!?" How dare the Survivors take a stand in what they call -"The City." Now it is not only "The" City, it is "their" city! How dare these young people boldly stand in the public square and declare abortion to be the evil of their day? But they did! And the news covered us like an unexpected snow storm! The San Francisco Police Department, long used to angry and violent protestors from the left, was impressed by the young Survivors. The Survivors were bold but polite, strong but not violent, and courageous in the face of the angry citizens they did meet. The SFPD described one Survivors event in a San Francisco Chronicle article as "well planned and perfectly executed" - that is a great endorsement of the training of the Survivors. I love activism in San Francisco! It is a hotbed of liberalism and an international tourist destination. The distance from one location to the next is only a matter of miles! In, fact we only left the city once to travel to nearby UC Berkeley to take a stand in Sproul Plaza where again our young Survivors engaged and answered every argument thrown at them with ease! San Francisco is the perfect place to train young people to be bold and to know they can hold their own intellectually, scientifically and underpinned by their faith and the rightness of their cause, they can win the day! Don't discount the Survivors because they are young! I was recently in a national pro-life leaders strategy session. The best of the best from all over the country and do you know what I noticed? It made me realize the Survivors must continue to raise up anti-abortion leaders as if this fight is going to last for generations and fight for all we are worth to end abortion now! We must continue to refresh our ranks, not with namby-pamby pro-life activists who just want the world to love them but rather activists who believe abortion is the killing of a little baby and will act like it! And graduates of Survivors training camps know that they will not be loved by this world while they are confronting the evil of their day. They know, and the next graduates will know, that social transformation is not a popularity contest and the greatest of social reformers were hated long before they ever had streets named after them. Now I am proud to say that graduates of our Survivors ProLife Boot Camps are bold! They were trained and equipped and prepared to fight! And they are everywhere! They come up to me at walks and marches and conventions and say hello. Many of them I do not even recognize -they were kids when I trained them! Many of those young people trained are today's youngest and brightest leaders. At our Dallas training camp and last year in San Francisco, we had former camp graduates who did our trainings. Leaders who are leading in their own right in Students For Life of America, Stanton Health Center, Priests for Life and many other fine organizations!!! It makes me proud! It should make you proud! For it is and always has been because of friends like you that the Survivors ProLife Boot Camps have continued year after year! Twenty-one years ago, pro-life college campus groups were nearly non-existent. When the Survivors would go onto campuses the administrations were often so angry they would order illegal arrests! The Survivors were constantly harassed and arrested! The Survivors won every one of those cases and continued in the training you helped provide and now today the tide has changed. Campuses no longer arrest the Survivors for they know they will not back down. The Survivors are advocates and they will not surrender their First Amendment rights and they will not be silent about the killing of their brothers and sisters in the womb. The Survivors graduates make great leaders. Groups all across the country have Survivors graduates actively working and leading. Our friend, Mark Harrington of Created Equal knows the value of our training camps and the value of our graduates! His team is and has been led by numerous graduates of Survivors camps. This is why we have our Survivors ProLife Training Camps: To recruit, train and equip young people to continue on in the fight for life in whatever organization God calls them to and wherever God calls them to! This year at camp, we will see some graduates joining us from our very first Survivors camp, twenty-one years ago! Yes, Twenty-one years ago our camp was made up of less than twenty young people and the oldest was just 17! They are still in the fight, leading on organization boards, leading organizations and still fighting the good fight across this nation and around the world! The Survivors training camps transforms teenagers and college students! Just one example I love to speak of is that of Hector Moreno. Hector was a well-educated man, a District Attorney for Santa Clara County in California. How did I meet Hector? It was in my Operation Rescue days and his office was prosecuting me for blockading baby killing centers. Hector was a good man and he went to a great local church. I did my time for saving babies and many years later started Survivors. When Hector heard of our Survivors ProLife Boot Camps he sent his own precious daughter, April. Now, April was a quiet and demure girl. April graduated our camp and later that year I was standing with Hector in San Francisco after the first Walk for Life. The Survivors were there doing an after-walk event. As I stood there with Hector, suddenly some angry passerby stopped to engage, but mainly yell at, the Survivors for daring to speak the truth about abortion. As the yeller walked away smug in her banalities, suddenly a young girl stepped out of our line to challenge her face to face! As I stood next to her father, a district attorney -I watched his mouth drop open! Was that really his little April going nose to nose with an angry San Francisco citizen and not only holding her own but backing her down!???!?? Hector told me he would never have dreamed April could ever be so bold. He thanked me and therein the entire team of people who train at Survivors training camps for transforming his beautiful little girl into a fearless, faithful defender of life! That is one of my favorite stories, but it is one of a hundred. Survivors training camps transform young people into courageous and bold Soldiers of the Cross! The young people are transformed with training from national leaders from all across the country and the world. Those who have taught and led at our training camps reads like the who's who of national and international pro-life leaders! Priests for Life, Created Equal, Students for Life of America, Rock for Life, American Life League, Stand True, Stanton Health Centers, Stand to Reason, Life Training Institute, Christian Defense Coalition, Life Legal Defense Foundation, Operation Rescue, Youth Defense from Ireland, Abortion Free New Mexico, CEC for Life. On and on it goes - I know I am forgetting dozens of organizations who have graciously given in the past to train Survivors. I thank them all again and apologize for those omitted! That is what I love about the pro-life movement - they sacrifice their time and their energy willingly and graciously to train and equip others to fight for life! The Survivors do not pay our speakers, sometimes we are able to help with airfare but each and every speaker and trainer who comes to camp is sacrificing to be there! I love them and thank them for their sacrifice and generosity. These leaders know our camp is a financial loser. They know the staff of Survivors sacrifices to make it possible. My own wife and children and friends do all the cooking during camp, sometimes for upward of 100 people! Everyone gives of their time and energy and finances to make this camp possible! This is why we are able to keep our nearly two-week camp at only $450.00. That is only $45 per day for food, housing, staff, transportation and a myriad of supplies! But I need your help! I want to make this camp even more affordable! I want to offer a special discount, an early bird discount through June 15th. What I am thinking is giving this discount to anyone who signs up before June 15th and an even deeper discount for those who come in a group! There is nothing better than a mini-team coming from a town or pro-life group. But I can't afford to do that without your help and your own sacrificial giving! I ask every leader, every speaker, to give of their time and energy to make this camp possible. This camp costs way more than we charge and if I had my way I would charge nothing at all! But I'm not rich so I can't do that. However, together, you and I and others giving as generously as we can with what God has given us -we can make this camp and early bird discounts a reality.Our lowest group and early bird discount price is $300. That means we will be at least $150 short per person. Will you give $150 to help make up the difference so a young person can come to camp on the early bird? Maybe you can give enough for a mini-group of five to come and can give $750? That would be spectacular! Last year we were saved by one very large and generous gift -it really helped us last year and we are thankful to those who can give so generously. However, in the end, this camp is usually made possible by friends who give faithful gifts of $35, $50 $75 and $100. Your gift does make a difference. Please give the best gift you can today by clicking the buttons below. These camp expenses come fast and furious before camp ever starts. We need you and your support today if you can. Thank you very much. P.S. Camp this year is July 23rd through August 2nd in San Francisco. As I said earlier, I love activism in San Francisco! It is a hotbed of liberalism and an international tourist destination. It is the perfect place to train young people to be bold and to know they can hold their own intellectually, scientifically and underpinned by their faith and the rightness of their cause, they can win the day! But we can't win the day if we don't put the camps on! And the only way we can do this is with your support of the work of Survivors and this camp in particular! Please invest in the future of those called to defend life. Give the best gift you can today. Please, we will handle the rest! Tactics Never Before Used. Strategies Never Before Unveiled. A Grassroots Youth-Led Revolution. Don't share your beliefs, don't talk about loving life and preborn babies. No, you sit still and listen to everything your liberal professors want to cram down your throat! Our young people are told to accept that abortion is a moral positive. That it is all about women's rights and social justice and equality. But that is a lie! nice and never wanting to offend. I applaud their efforts. You cannot wait for people to want to change, they will not come to you! You must confront them with truth! made the perfect set up to expose Planned Parenthood for who they are and what they do! 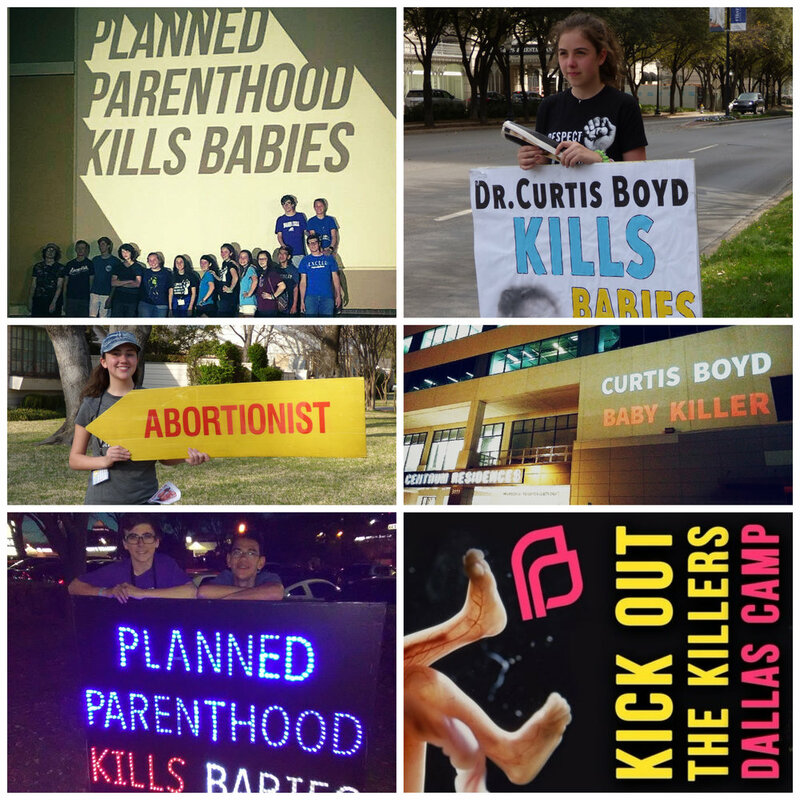 The other was the apartment building of abortionist Curtis Boyd. 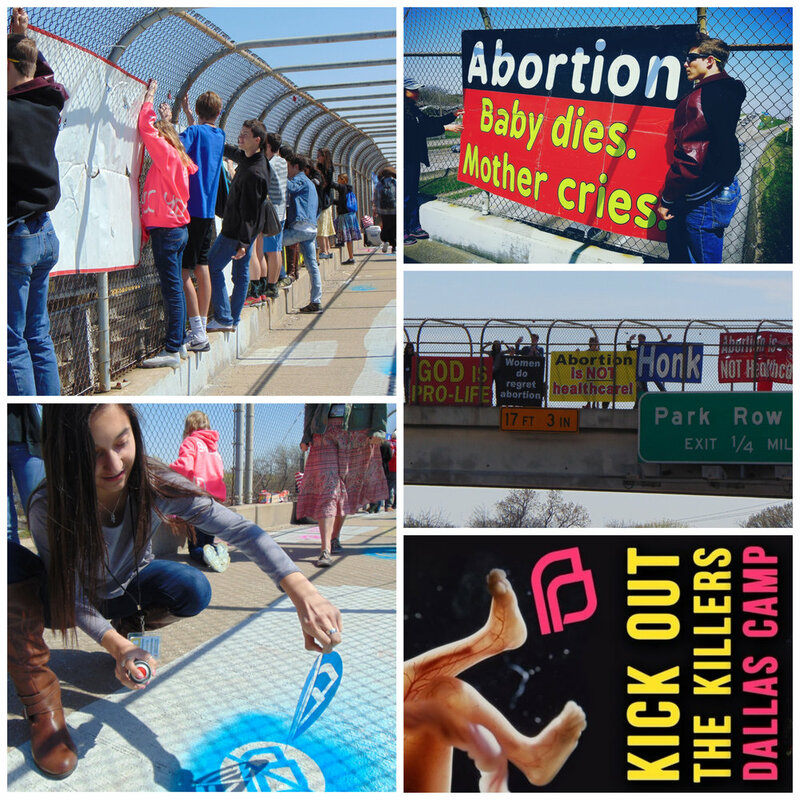 Here are some examples of larger guerilla projections by leftist groups. I believe Fetal Uprising projections will have greater impact because abortion is so controversial. But don't you just love it! No! Don't Talk to Al Jazeera! No! Don't Talk to the BBC!" No! Don’t talk to Al Jazeera! No! Don’t talk to the BBC! Why did many tell us this? Because they believed the liberal media hates conservative pro-lifers and they are worried they will lie about the Survivors. Now I am not naive, but there two things I do believe in and even though I agree the liberal media is not our friends, I believe. I believe our young people are sincere and transparent and good teens and college students. I was confident their goodness would come out. I also believed our camp would take those great young people and teach them to be truthful, bold, loving and well educated on the topic of abortion. Which would make them powerful ambassadors for life! Watch the videos below, they are great! These are not our friends, these are people who told me right up front they were pro-choice. The BBC even called their documentary -- Brainwashing Stacey! The portion of the Al Jazeera video that features Survivors is only about five minutes. The BBC Brainwashing Stacey video is 45 minutes. These both aired all around the world. Take a look and also read the Al Jazeera newspaper article -- I think it is the best article we have ever had written. Watch and read these media accounts of the Survivors Summer Training Camp and you will understand why leaders from around the country consider it the best youth training camp in the nation and why many send their own teens and students to our camp. Enjoy, and then join us or send someone to camp this summer in San Francisco! Read the article from Al Jazeera English: "A trip to a summer camp pushing to end abortion"
That fanfare, however, was short lived, as leaders within AHA soon became hypercritical of every major leader in the movement, and even more critical of the Catholic Church, which they believed to pretty much be the Antichrist. As they received push back from every kind of pro-lifer for this overwhelming aggression, AHA pushed even harder, ultimately claiming that the current movement had failed from being too soft, and that AHA's "new" approach (of establishing chapters and handing out literature - true story) would finally end abortion. They washed their hands of the movement. And now, not many would know who they are. So, enter the New Pro Life Movement, an ambitious group began by Patheos bloggers Rebecca Bratten Weiss and Matthew Tyson, in response to Trump receiving the Republican nomination. The NPLM is the cheery version of AHA, who wants to work with everyone (as long as they didn't vote for Trump), but remains publicly hypercritical of the current movement. Like AHA, they too, believe the movement has failed - but not because we are too soft. Rather, because the movement is too hard. Too narrowly focused. And more Republican than they can stand. include: The Right to Life, Abortion, Women's Rights and Justice, Euthanasia, War, Death Penalty, Healthcare (Universal), Poverty, Environment, Gun Violence, Social & Political Involvement. The list itself is not problematic. Any pro-lifer could hold a number of opinions on some of these issues without compromising a pro-life stance. (Again, pretty sure Democrats for Life of America has been doing so for years.) The list itself should not concern the pro-life movement. However, the philosophy and means by which they aim to address and accomplish this "new pro-life movement" should be very alarming to anyone involved in the fight against abortion. The NPLM focuses on the idea of eliminating the demand for abortion, rather than supply, believing that this will close the distance between pro-lifers and abortion advocates. In order to do this, they reiterate again and again the idea of finding common ground with abortion supporters, banking on the sentiment that no one really wants abortion, and rejecting the concept of a "culture war." They truly believe that abortion supporters will just come alongside them once they calmly explain that they are helping pregnant women. "Our goal is not to defeat this or that cultural opponent," they write on their website. "We believe we will be more effective in creating a culture of life if we are able to find common ground as often as possible." In his most recent video, co-founder Matt Tyson says of abortion supporters, "I guarantee you they can get on board with helping women...No one is going to complain if people stop having abortions. They're just not. That's not a thing. That's not going to happen." Rebecca Bratten Weiss strongly agrees with this idea of bringing abortion supporters "on board" with the NPLM. In a recent blog post criticizing the March for Life (along with the rest of the movement), Weiss writes, "I have encountered more and more thoughtful, ethical pro-choice advocates who sincerely believe that we need to have fewer abortions...."
Ok, sure. Your average pro-choicer on the street might say they'll go for fewer. But "fewer" certainly is not zero. Fewer is not removing abortion altogether. What do they say when you propose that? (Answer: Abortion on demand without apology!) Because the idea of "reproductive choice" is not based on circumstances or volume; it is based on the preborn child having no rights and the woman exercising "bodily autonomy." The reason isn't what matters to them. The "right" is what matters. Not to mention that a person you spoke to at the Women's March is not a Cecile Richards, or a Barack Obama, or any number of powerful people who have made certain that abortion is entrenched in our society. For them, abortion is not a debate, it is a directive. And they do not engage in peace talks. Yet, Weiss believes she can build a pro-life culture with any of these people. In this same article, she discusses building bridges with "many responsible and ethical pro-choice feminists and political leaders." Ironically, NPLM states under their Pillar against War that "military force is only justifiable when absolutely necessary to stop an unjust aggressor and protect the lives of innocent human beings." Over the last four decades, sixty million innocent lives have been destroyed by the unjust aggressors of abortion. If that's not a war, then what is? This is perhaps the most hypocritical slant of the "new" movement. There's room for an "ethical pro-choicer" - whatever that is - to sit at the table. But if you are already pro-life, suddenly the standard flies skyward. There is no middle ground on gun control, or healthcare, or the environment - issues on which pro-lifers have always held varying opinions with no trouble. Under the "new" movement, you can't believe that any one of those things, abortion included, is more important than the other, or you cease to be pro-life. "Slavery is wrong. Abortion is wrong. Neither statement requires further qualification." The all-or-none approach is strikingly similar to how Black Lives Matter proceeded (and AHA, actually). The BLM movement, organized under the banner of ending senseless police violence against African Americans, also adamantly chose to include advocacy in favor of LGBTQ, abortion, and "dismantling the nuclear family." And, much like the current NPLM, if you cannot embrace every platform then you cannot truly believe Black lives matter. It's actually pretty tyrannical. And it's in this same vein that the NPLM is creating their line in the sand, while simultaneously criticizing pro-lifers who prioritize the fight against abortion for...well, drawing a line in the sand. Is it possible that the NPLM simply thinks that by including more issues on equal levels, more people will join their movement? Perhaps they do. And perhaps they will. But will more preborn children be saved? Absolutely not. You can't fight on eleven fronts at the same time and hope to win. The pro-life movement formed in response to legalized abortion. It formed as passionate citizens came to the rescue, quite literally, of innocent preborn children being torn apart in the womb. To lose that focus is to lose the movement. Moreover, abortion is a systematic evil that tears away at the fabric of any society willing to embrace it. If the NPLM wishes to end poverty, war, or gun violence - then end abortion. Because as long as a child in the womb - innocent and defenseless - is not deemed worthy of protection, then no one outside of the womb, with far more means to defend themselves, ever will be either. The NPLM is also unequivocally feminist. It seems to be the lens through which everything they articulate is filtered. In fact, "feminist activists" is the only group on their About Us page that is welcomed by name: "We especially welcome feminist activists who share our concern for opposing those societal evils that drive women to abortion...."
In their 11 Pillars, NPLM states that "women are the central figures in the abortion debate" (not the preborn). And there's no mention of fathers either, who are also devastated by abortion. This kind of narrow focus has the potential to gloss over the true crux of the abortion issue: personhood for the preborn. "It's true that abortion can be physically and psychologically harmful to a woman. But what the pro-life movement fails to note is that in many cases, NOT choosing abortion will hurt women more. They'll be kicked out of homes and schools, fired from their jobs, shunned by their communities. Lacking medical coverage, they will sink into crushing debt. Lacking funds, they can't take time off work in the event of a high-risk pregnancy. Infant and maternal mortality rates are an issue here. Often, they can barely even feed the children they have. They may be stuck in abusive marriages, and be afraid to bring a baby into a violent home." Weiss gives zero attention to the fact that when a woman chooses abortion, a child is denied her basic right to life and ripped to pieces. Instead, she makes the bizarre argument that a woman choosing not to have an abortion - that is, choosing not to become implicit in her own child's horrific death - can be more physically and psychologically damaged by making a choice for life. Under their Pillar for Women's Rights & Justice, the NPLM also complains that the current movement has failed to help pregnant women, stating that there is "too much time spent arguing with the social and political figures who support abortion and not nearly enough time spent helping the women who actually have [abortions]." They seem to ignore the fact that, while abortion clinics are currently in the hundreds, pregnancy resource centers are now in the thousands. Or that every day countless sidewalk counselors stand outside of clinics, in every type of weather, for hours on end, to offer women alternatives to abortion. Or that resources like Rachel's Vineyard and Silent No More exist and were created specifically to help women who did choose abortion. It seems the NPLM has all kinds of criticisms to readily offer against the pro-life movement, and "new ideas" to try - like helping women. Ultimately, however, it fails to acknowledge a long-standing history of compassion and hard labor made evident through the hundreds and thousands of resources now available for mothers and fathers and their preborn child. Not to mention counseling and services available to abortion workers looking for healing and a new life. As a movement, we all try to hold the title of " truly pro-life," and decide for ourselves what that ought to mean. We've condemned harsh, negative phrases like "anti-abortion" or "anti-choice," instead favoring more relevant, approachable terms. In many cases, we've lost sight of the essence of our movement or have sacrificed our purpose in order to be more accepted by society. It would be ridiculous to expect all those who claim the label of "pro-life" to fit the same mold. We all come from different backgrounds and hold different values; however, in our differences, we must be cautious that we do not place our own desires over the lives of preborn children in need. We must remember that to be pro-life, first and foremost, we must be anti-abortion. Over the past few weeks, Survivors brought to pro-life Americans the Personhood Proclamation Petition. Drawing from Ronald Reagan's Personhood Proclamation, our Petition asks President Trump to make the personhood of preborn human beings his official policy through an Executive Order, sparking a showdown in the Supreme Court. LAST WEEK, PRESIDENT TRUMP BEGAN TO PUT THE PERSONHOOD PLAN INTO ACTION! But your message to Trump and his administration is critical. And tomorrow is the deadline for public comment! We have pro-life friends in the Department of Health and Human Services, and HHS has written in its Strategic Plan for 2018-2022 that it will serve and protect "Americans at every stage of life, beginning at conception." This is exciting because it goes hand in hand with our Personhood Proclamation efforts and will anger the pro-abortion forces. We want them angry, and we want Trump to go further in issuing an Executive Order that makes personhood of the preborn the policy of ALL executive agencies. The Executive Order will generate a historic showdown in the Supreme Court because of the lawsuits filed by those angry proaborts over personhood! BUT THIS WILL ONLY HAPPEN IF YOU TAKE ACTION TODAY. 1. Send a comment of support to the HHS. 2. Sign and share with everyone the Personhood Proclamation petition. The HHS has opened its draft plan for public comment through October 27. SEND YOUR COMMENT OF SUPPORT TO THE HHS NOW! As a pro-life friend of the Survivors of the Abortion Holocaust, I want to express my very enthusiastic support for the HHS' draft language that promises to serve and protect "Americans at every stage of life, beginning at conception." I urge President Trump to go further in issuing an Executive Order that makes personhood of the preborn the official policy of all executive agencies. This will generate lawsuits and a historic showdown in the Supreme Court over personhood. sign the Personhood Proclamation petition! I want to be straightforward because I believe what I am going to share is so simple it could only have come from God. It is a vision to end abortion in America! Thirty years ago this January, President Ronald Reagan published a Personhood Proclamation. It is a beautiful proclamation declaring that personhood begins at the moment of conception and continues to natural death. It is a stunning proclamation, a philosophical statement and a wonderfully worded affirmation of the value of human life. But it had no teeth, no power, and in the end – NO EFFECT! What we needed then and what we need now is Reagan’s Personhood Proclamation attached to a President Donald Trump Executive Order!!! Hear this and see the simplicity! Donald Trump issued an Executive Order travel ban, and what happened? It was immediately enjoined by Federal Courts and ended up going before the U.S. Supreme Court in less than 3 months to decide the matter! Donald Trump signs an Executive Order declaring the personhood of the preborn child! Better yet, he signs an executive order attached to Ronald Reagan’s Personhood Proclamation thirty years to the day after Reagan issued the original proclamation. In his Executive Order, President Trump will direct all executive agencies under his control to immediately apply the Executive Order to their operations. Suddenly, abortions could be illegal in the military. Federal agencies would have to grapple with how to apply the history-making executive order! And the lawsuits will come flying in!!! Injunctions will flow like honey from those who oppose life and want to protect the Abortion Cartel! The cases go before the Supreme Court and the court must finally decide what it purposely and shamefully failed to address in the Roe v. Wade decision! Today, science is clear as to when life begins. The Unborn Victims of Violence Act of 2004 (Public Law 108-212) is a United States law which recognizes an embryo or fetus in utero as a legal victim, if they are injured or killed during the commission of any of over 60 listed federal crimes of violence. The law defines "child in utero" as "a member of the species Homo sapiens, at any stage of development, who is carried in the womb." And certainly, God is clear. Now all we must do is get the Supreme Court to give to babies what was not given to blacks in America until the 13th 14th and 15th amendments to our Constitution -- PERSONHOOD! And when the Supreme Court does what it should and recognizes the personhood of every preborn child, ABORTION WILL COME TO ITS LEGAL END! A vision so clear, a path so straight, it could only come from God. Share this idea with everyone you know! Have them sign the Personhood Proclamation. When they do, I will forward them an email they can send to all their friends to enlist them in this unprecedented fight for life. Give a donation today! Give like never before. In my letter I put in hashtags -- #TrumpLegacy #PersonhoodProclamation #ReaganTrump. If you don’t know what those are for then please double or triple your donation!! Those hashtags commonly used in social media create what they call trending topics. Thirty years ago when I got in the fight for life we had flyers, handed out in churches and in the public. We sent letters at incredible expense. We ran even more expensive print or radio ads. We were fortunate if we reached a few thousand with the message. Today we have social media and it has revolutionized the call to action! Countries have fallen because of the impact of social media! I will continue to send out thousands of letters but we MUST get onto the social media tracks if we are going to get this done!!! We must persuade President Donald Trump to sign an executive order declaring personhood for the preborn baby. We have access to the President like never before. I know people who can speak to President Trump directly. Charmaine Yost who was with Americans United for Life is in the Trump Administration! Jay Sekulow used to represent me and other national leaders in Operation Rescue and now he is an attorney to the president and popular spokesperson for President Trump. Alveda King, a friend, a great pro-life leader, and the niece of Dr. Martin Luther King recently spoke at the Trump rally in Arizona at the request of the President. These friends ALL have access! And I know there are many more. That is why your gift -- and I am asking you to give like never before – is so vitally important! We must make this frontline news! By sending out thousands of letters just like this one. Asking our friends if they know anyone with access to President Trump and asking them to bring it up to the President. Say what you will about President Trump, I believe this about him: When he believes something is right he acts on it. He is a man of conviction. And I believe President Trump is pro-life to his core. I believe he will sign a Personhood Proclamation Executive Order! When he does it will set in motion the wheels of justice that will bring an end to legalized abortion in America! Step back non-believers! Go home naysayers! Now is the time for faith and action! Now is the time to give so we can spread this message and plea for sanity in America and all across America! Please right now, I am asking you to give the very best gift you can, a gift greater than the biggest gift you have ever given. The walls of the Abortion Cartel’s castle of lies are crumbling and we MUST rush through the breach! Now is the time. I must get this out to tens of thousands, hundreds of thousands if I can. But I need your help now! Please give now. As if your life depended on it because the babies’ lives do. You will be hearing a lot from me in the coming days. I will keep you abreast of this charge towards victory. Please be a part of this historic battle and we can end this killing. I hope I speak for all pro-life advocates when I say that I am sick to death of the endless fighting over Planned Parenthood (PP) funding coming out of Washington, D.C. Babies are dying and nothing is getting accomplished. The lies, propaganda, and carnage continue unabated, led by pro-abort progressives and the profit-driven baby butchers at Planned Parenthood! Pro-abortion zealots will never stop fighting for the right to kill and unless we take decisive action now, Planned Parenthood and clinics like theirs will continue to thrive on America’s abortion-for-profit enterprise. In fact, the news from D.C. is getting worse. After months of delay, Planned Parenthood finally released their required-by-law non-profit 2016 annual report. They didn’t want it revealed but they had no choice. The numbers are horrific. Over 300,000 abortions performed at Planned Parenthood clinics. Over $500 million dollars taken in federal subsidies. Dramatic declines in non-abortion “planning” services. This is not “planned” parenting, this is a holocaust and the victims are the babies whose bodies are being ripped from their mother’s womb! Washington is not solving this. Planned Parenthood is too rich, too powerful and utterly ruthless in its campaign to keep abortion a part of American life. I am sickened by this and I hope you are as well. It has got to stop and the ONLY way we can begin to save babies today is to march to the front steps of Planned Parenthood and one clinic at a time -- shut this monster down! It can be done! We know how to do it. We’ve done it before and we can do it again. Each time we do, hundreds and maybe thousands of babies can be saved. It’s time to act decisively and we now have the pro-life recruits to succeed, but they need to be trained first! For the last twenty years Survivors of the Abortion Holocaust has been the premier pro-life organization in America that trains and deploys pro-life advocates to effectively, legally, and safely fight to save babies and their families from the horrors of abortion. Our list of graduates and participants include some of the most respected and successful pro-life advocates in America today. But it’s the rank and file, the new young recruits that we must focus on now. This year we have maxed out our training camp budget, but we have a tremendous list of passionate young people still waiting to be trained. We do not want them to stay home! We want them with their youthful zeal, in the field saving babies! If we raise $45,000 over the next 30 days, we can have one hundred new pro-life warriors trained, deployed, and stopping abortions almost immediately following graduation! Imagine being spat upon, physically attacked, handcuffed, and thrown in jail simply for standing up for the life of an unborn child. Most people wither under that kind of intimidation. Not our guys. Not our warriors! Every young person we put on the street will have enormous impact, especially these courageous youth who connect so easily with their peers. They have the passion, but standing up to the abuse, vitriol, and legal threats thrown at their pro-life activities takes guts and determination. They’ll be taught how to handle it. They’ll be trained how to stand their ground, even against the harshest attacks. They’ll know their rights because we’ve trained them. They’ll know their mission because God has called them to rescue those unjustly sentenced to death (Proverbs 24:11). They’ll also know that when things get really serious, we and our supporters like you have their backs! That’s empowering stuff! But our pro-life warriors can’t just hit the streets carrying signs and chanting. Imagine going up against a crazed mob pumped up by the juggernaut Planned Parenthood. It’s a daunting, potentially dangerous situation. Over the last few years in particular, pro-life, anti-abortion activists have faced some of the harshest attacks ever. I’ve seen passionate young pro-lifers attacked, bloodied, and arrested for speaking out to save a baby’s life. Very often our young Survivors are those activists! We learned long ago that to be truly effective, every pro-life activist must be trained to stand against the machine, to face the hatred, to win the battles, and to lay down their lives so others may live. In other words, we want their protests to do more than make noise, make the news, and maybe change some minds. We want them to save the babies and force abortion giants like Planned Parenthood out of our communities -- for good! And that’s exactly what we are accomplishing. I’m proud to say that our pro-life warriors, graduates of our Survivors training camps, are having a profound impact where it does the most good, at the front door of the abortion clinic. It started by training our Survivor warriors to know and defend their rights. We had already won an important case that established our constitutional rights to target an abortion clinic’s business. We tested those rights. The clinic knew we were coming and had local police, federal marshals and the abortion clinic’s own off-duty policeman standing by. Undaunted by the show of force, our warriors took positions at the front of the clinic and knelt in prayer. Within 48 hours we were back in court only this time our rights were affirmed. We returned to the clinic the next day and kept firm with our vigil. Six months later -- that abortion clinic closed for good. Make it local. Make it impactful. End the abortions. When determined young pro-life advocates take their message to the front door of the abortion clinic in their own hometowns, abortion rates plummet. And our number one tar get is Planned Parenthood, the poster child for profit-producing abortions. Planned Parenthood’s weakness is greed -- and we’re exploiting that. If you run a Planned Parenthood clinic and don’t turn a profit, you’re going to be shut down. That’s right, Planned Parenthood is not in the business of women’s health, they’re in the business of killing babies and make a hefty profit as a result. Just look at what they pay Cecile Richards (PP CEO). She took home a half-million dollars last year while pontificating on national media about the “essential” work PP does to deliver women’s health services to the under-served. Last year, Planned Parenthood closed 20 separate PP clinics. These clinics all had one thing in common; not one of them was turning a profit! That’s where our warriors are trained to fight most effectively. We don’t close the clinics, Planned Parenthood does that for us! Our warriors are trained to go straight to work on a single clinic setting up legally sanctioned resistance to the abortion services. With persistence and proven and effective tactics, the impact is felt inside. Abortion services plummet. Patients disappear. Babies do not die. And when PP no longer profits from abortions, they order the clinic to close their doors! If they can’t make a profit, they are shut down! Last step of a desperate clinic -- Planned Parenthood builds a wall! In a desperate move to protect their abortion business, PP actually built this wall to keep our warriors away. Could this be their last attempt to save this clinic? It didn’t stop our warriors from keeping up the pressure and stopping the abortions it performed! One at a time. Clinic by clinic. Kill the abortions and you kill the clinic. With persistence and determination, coupled with a full understanding of their rights, Survivor warriors begin eroding the financial base of the targeted clinic then erase the abortion business entirely. And when the abortion revenue dries up, the clinic shuts down. As I stated above, Planned Parenthood’s weakness is its greed. And what works to shut down a PP clinic works to shut down any private clinic as well. Last year PP shut down 20 of its own clinics because those clinics could not remain profitable. We believe that we can force them to close even more this year. That’s why it is vitally important that we train as many of these young, enthusiastic pro-life warriors as possible. You can help us achieve that objective. This important new fundraising drive will determine how many additional Survivors training camps we can host this year. And we have to move quickly. Most of our attendees are students who are only able to make summer dates. It is urgent that we get as many young warriors as possible trained for battle this summer. Your immediate support is crucial to the success of our 2017 campaign. These young adults will be out there fighting for what we all believe in -- the end of abortion in America. Our young warriors are taught how to interact respectfully and lawfully with the authorities which are often called out by abortionists. Over the decades we’ve had many unlawful arrests -- but w e’ve never lost a leg al case where our warriors rights to protest were being challenged. If you share that belief, we pray that you will take a moment right now to help these young pro-life champions with your generous financial support. For every $450 we raise we can get another pro-life warrior trained and deployed. We have a tremendous waiting list of young people ready to answer the call and willing to sacrifice their summer to learn to save lives, we need only to find people like you, willing to give to make camp possible for these young people. The young people who make up the core of future pro-life activities are the least able to afford attending. Your help makes their participation possible! We cannot keep these young eager activists standing in line for another 12 months, or worse, missing camp altogether because they cannot afford to come. We need them out there fighting for life now! We need them standing in front of a Planned Parenthood clinic fighting against this for-profit abortion monster. We need them returning to their hometowns fired up and leading the fight to end abortion where they live. We need them to carry that fight, and to be prepared -- to prevent them from being abused, assaulted or arrested by authorities or pro-choice abortionists! Knowing their rights and proper training can win the day! We recognize that our trainees’ passion alone will not stand against the pressure of pro-abort zealotry -- particularly when that zealotry is fueled by the lies and propaganda from the progressive left and America’s number one baby-killer, Planned Parenthood. 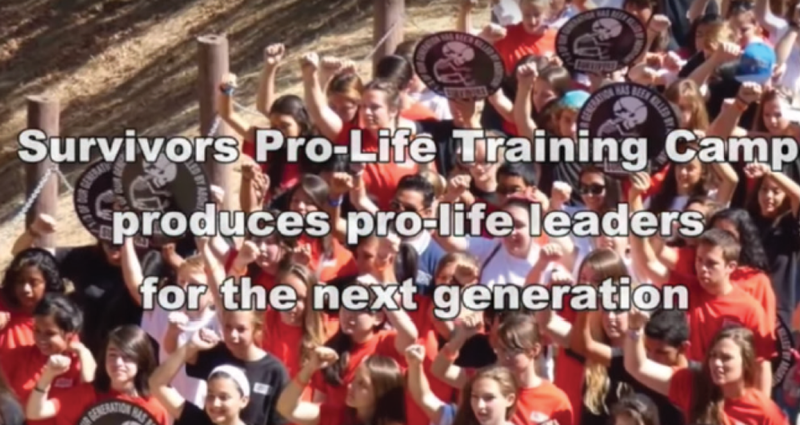 To be effective, to be safe, these young pro-life warriors need our support and our training. We know that. We’ve been on the streets ourselves. We know how to challenge the abortion cartel and their propaganda. We know how to make our voices heard and do so without violating the law. Most important, we know how to change the hearts and minds of the young women and men who have been seduced by the treachery of baby butchers and the lies of “pro-choice” rhetoric. This is what saves the babies. Keep in mind what we are up against, perhaps the most powerful and richest lobbying machine in America today, Planned Parenthood! The passion and the commitment of America’s next generation of pro-life activists is simply not enough to stand alone against these butchers. As must be the case for all effective armies, the troops must be trained! They must be provided the tools, resources and support needed to face their adversaries. That is our core mission at Survivors of the Abortion Holocaust. We are the oldest pro-life, anti-abortion organization in America today exclusively focused on the young people who are so desperately needed to win our war against abortion. As a fellow pro-life advocate you must surely recognize that the passion and the commitment of the next generation must be nurtured and harnessed. That’s precisely what we do at our training camps. We teach young advocates what works and what doesn’t. We show them how to respectfully and righteously stand for life and expose the lies of the abortion cartel. We teach them how to save the lives of the innocent. Today the demand for our camps is greater than at any time in the past. We desperately need new funding to expand our program and get these warriors-to-be out there fighting for life! To accomplish this, we need to raise $450 for every new recruit that wants to attend our training camps. Many who attend pay all or part of the bill themselves; that’s how passionate they are! But most are young with limited means. To attend, they depend on the support we receive from outside donations and sponsorships. We must never turn away these pro-life activists for lack of funds! Over the last twenty years, our group, Survivors of the Abortion Holocaust, has trained more pro-life, anti-abortion activists than any group in America. We are reaching out to the pro-life community to help us train all who want to fight for the lives of the preborn and end abortion in America. Please take a moment right now to consider how your financial support today can enroll a young activist who cannot afford attending camp on their own. For one new pro-life warrior, $450 provides everything to complete the training -- food, housing, curriculum, experienced leadership -- it’s all provided. We pray that you find it in your heart to help us prepare one young person for a future of pro-life advocacy. Of course, any amount that you feel comfortable providing will be put to work. It only takes a few smaller donations to total a full sponsorship. Many of our young attendees are intent on devoting their summers to pro-life activities. We hope to aggressively expand our Survivors training camp schedule this year to take advantage of their availability. So please, do not set this aside. Should you decide to donate, we ask that you do so without delay. And never forget, more babies die every day, which makes the cost of delay intolerable. Thank you for any support that you can provide and God bless you for believing that abortion remains the most heinous of sins and cannot be tolerated in our America. One final thought: We will be concentrating our efforts on closing Planned Parenthood clinics for a few reasons that may not be obvious. Every time a PP clinic is shut down due to our efforts, others take notice. That would not be the case if we targeted an unknown local clinic. Additionally, every time a PP clinic is closed because it can no longer remain profitable, the duplicity of the Planned Parenthood lie is exposed. They are not in business to provide a community health service, they’re in the business of making profit from killing babies. Nothing makes that more obvious than when they close a clinic because it no longer turns a profit. Help us expose these people and their lies for what they really are! to be the core of our 2017 Pro-Life Campaign! Your contribution today will help put young, pro-life warriors on the streets fighting to save the babies and to end abortion in America! This summer, we will deploy as many fully prepared pro-life warriors as we can train to carry your’s and our message of life to the streets. This campaign will focus on Planned Parenthood clinics nationwide in an effort to close as many clinics as possible by end of the year! Your generous financial support today will make it all possible! Every man has a day they may regret for the rest of their lives. For Ronald Reagan that day was June 14 1967. VICTORY! False charges dropped against Survivors Founder, Jeff White! The incident occurred in November of last year. Since then, Aranda has argued that this was a false arrest and that the security team initiated the confrontation. We didn’t file an appeal of our eviction. Why? That’s a fair question. I can tell you this – I certainly wanted to! I didn’t want to give Planned Parenthood the satisfaction of getting away with lying on the stand and getting us evicted from our office directly across the street from them.